The mean and median values are shown in the next chart. There is a very slight upward trend in both values over the 18 months, but not much. Although there are week-by-week variations, the long-term numbers are consistent. 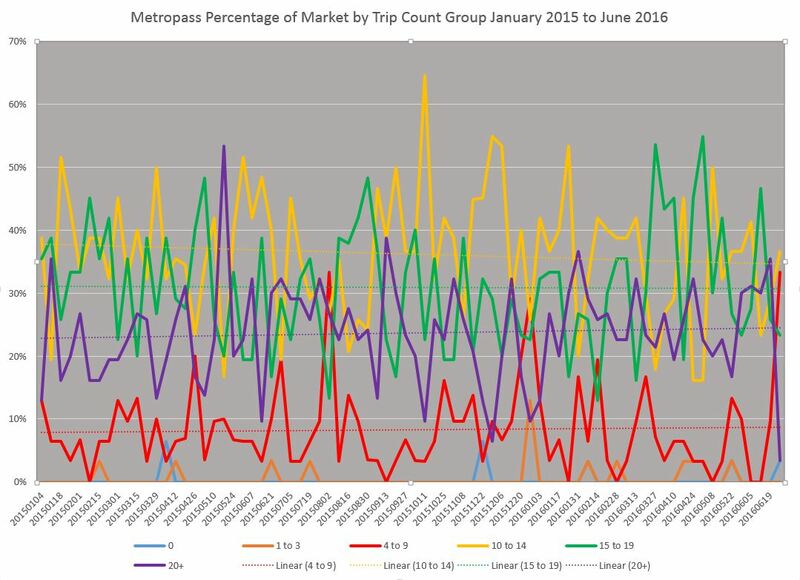 This suggests that those riders who have stayed with Metropasses are using them at roughly the same rate. Another factor could be the loss of low-frequency passholders back to single fares because they don’t consider a pass worth the expense. Removing them from the overall pool will increase the “average” usage of those who remain even though their travel patterns might not have changed at all. The actual proportions have changed a bit over the 18 months, but no group has declined precipitously relative to the total. 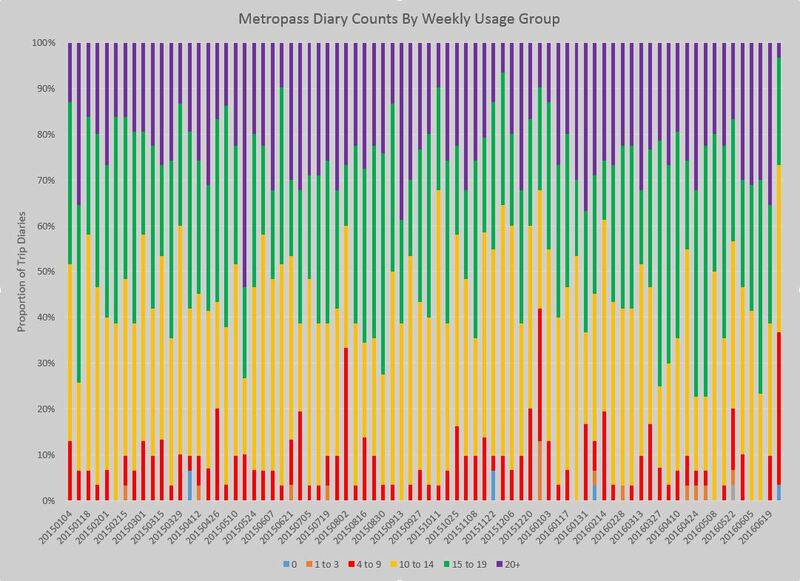 The first chart shows the proportion of diaries each week falling in various bands of usage. Of the diaries, about half fall at or below the 10-to-14 trip group, while the other half are above. The proportions vary each week, and effects such as holiday weekends show up as a drop in the more frequent riders. An important caveat here is that these data are not subdivided by type of pass, and even within a single pass type (e.g. “adult”) the effective cost to the rider (and hence average fare) will vary depending on whether they receive a discounted pass and how much tax benefit they obtain for buying transit fares in bulk. Adult passes sell for $141.50 per month at full price, or $129.75 on the subscription “Monthly Discount Plan” (“MDP”). With the token fare at $2.90, these prices correspond to multiples of 48.8 and 44.7 respectively. Passes for Seniors and Students sell for $112.00 and $102.75 (MDP). With the ticket fare of $1.95, the multiples are 57.4 and 52.7. The Post Secondary pass sells for the same rate as a Senior’s pass, but these riders would otherwise pay full adult fare. Therefore, their multiple is 38.6. The non-refundable federal tax credit reduces all of these numbers by 15%, although it is not a benefit a rider “sees” until long after a pass has been bought and used. There is no benefit to someone who has no taxable income. An average trips/week of 16.28 translates to an annual rate of almost 850 trips, or a monthly value of 70.7. This number is considerably higher than even the most expensive fare multiple for passes. However, it is important to remember that many so-called “trips” would probably not be taken if they required separate fares because they are short, convenience trips, or because they form part of a “trip chain” that would be uneconomic without a pass to eliminate transfer issues. The idea that somehow the “extra” trips beyond the break even point represent “lost revenue” is fundamental to arguments by those searching for any way to reduce TTC subsidy requirements. However, an increase in the marginal cost of those trips would drive many of them away from the system, or would simply result in increased “fare evasion”. As a simple example, yesterday was a “four trip” day for me, but three of those trips logically constituted a “trip chain” with stop-offs between each leg that would normally trigger the need for a new fare payment. This brings us to the basic question of whether the transit system should be hitting up riders for a new fare as often as possible, or if it should be making travel as simple as possible. Motorists, by contrast, do not face a large marginal cost for multi-stage trips, beyond the agony of finding free parking, and will commonly arrange their travels to avoid high cost stopovers where parking is limited and/or expensive. If the idea of transit is to provide an alternative to cars, then pricing its use in a way to even further reduce the perceived convenience runs counter to the claims many politicians make for having transit in the first place. 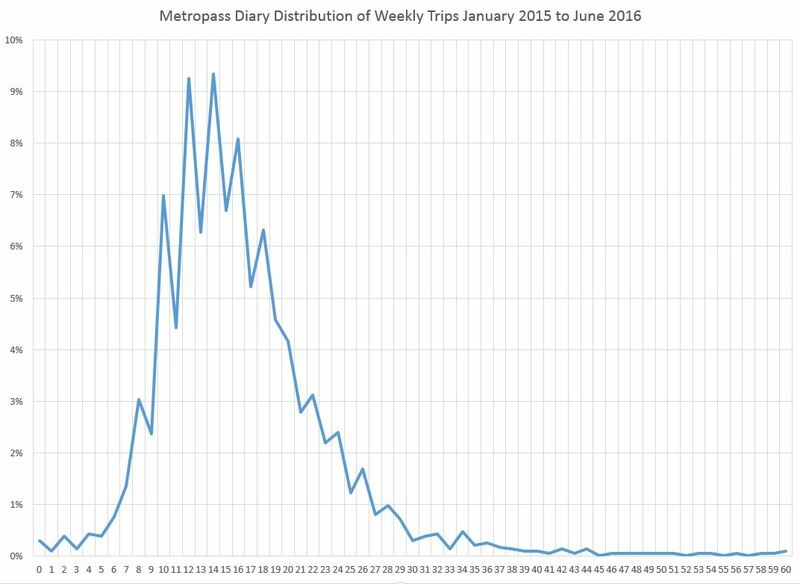 The trip diary data covered in this article do not include a fare change for the Metropass, and the pricing multiples actually fell in 2016 because token and ticket rates went up while pass prices were frozen. This freeze was a direct response to experience a year earlier when pass sales dropped after the price went up. 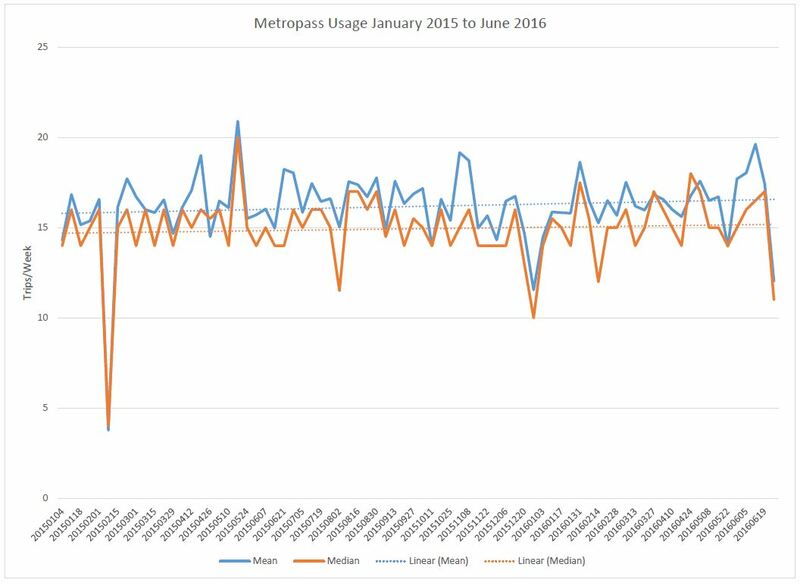 It is worth noting that the actual usage of passes, on average, has stayed almost unchanged since January 2015. The number of passes sold may rise and fall, but average usage stays the same. This is not surprising because once a rider has broken the link between paying at each step of a trip and simply using transit as a convenience, then the amount of use is more a question of service quality and availability, and the rider’s day-to-day needs for travel. During the 18 months covered here, there were 7 diaries returned with zero trips reported, probably because the users were not in Toronto, or otherwise not using the transit system. There was also one diary reporting 81 trips in the space of one week, or more than ten a day. The important point is that this is an outlier, and a fare structure should not be torn apart because a tiny fraction of riders get a very good deal out of passes. The bulk of riders, and those for whom any pricing change will have the most effect (both on them and on TTC revenues) lie in that central block of the trip distribution chart above. Where the challenge lies is with riders who sense that a pass may not be worth the investment either in absolute terms, or because they don’t want to spend all of their “TTC” budget in a single payment. The option to not buy a pass is not available to MDP subscribers, and so the reference point would mainly be full fare adults for whom the break-even is about 49 fares/month or just over 10/week. Based on the diary numbers, this is not a large proportion of the total, but neither is it trivial. Repricing the pass to lift the multiple would take more riders into that gray area where they would think twice about getting a pass. Increasing the multiple would shift more riders below the break-even line, and would increase their mental debate about whether convenience outweighed cost. That decision will change with a move to Presto when the convenience factor (use any turnstile, board at any door) of passes will vanish. Indeed, some of the low-end pass users may drop back to paying single fares because they can do so much more easily than today. Oddly enough, this will show up as a “ridership loss” for the TTC because passes are counted at the average usage level. Someone might take only 10 trips/week with their pass, but if they moved back to single fares, they would count as a “loss” of 16 pass-based trips, or a net loss of 6. Conversely, the convenience of a self-reloading Presto card could encourage them to take more single rides much as a prepaid coffee card ups the sale of lattes and double-doubles. The TTC already has plans to replace the Day Pass with a daily cap on fare costs through Presto. The machinery to do this already exists within Presto software, but it has not yet been turned on. A similar scheme could be used for monthly ridership much as GO Transit now caps charges so that rides beyond 40 in a month are free. Either of these caps will fundamentally change the way that people “access” pass-like pricing because riders would not have to decide in advance whether they should pay for a pass. Another factor that would bear on this is the concept of the “two hour transfer” already in place in GTA transit systems. Rather than enforcing the strict rules about stop-overs and doubling back on trips that have been a TTC hallmark for its entire existence, a “fare” would be valid for a fixed time period after the first “tap on” entering the system. The TTC has been mulling fare strategy for the past few years, but the two hour transfer was among the casualties of the 2016 budget because “we can’t afford it”. The anticipated lost revenue is about $20 million, although there is reason to believe that this estimate is too high by a considerable margin. In an era when the TTC faces subsidy cuts, the last thing anyone would propose is something that will “lose” money even though this might address other transit issues such as simplicity of fare collection and making transit more cost-effective for users whose riding does not fall into the classic two-trips-a-day commute pattern. Over half of all trips taken on the TTC are now paid for with some form of pass. The idea that fare debates turn on the cost of a token is becoming almost as quaint as the token itself when the real issue is how riders will pay for transit service in bulk. Any debate about the future of fares in Toronto must recognize that passes are the way people prefer to travel, and price the service on that basis rather than agonizing over the fictional “lost” revenue that might be regained if only those pesky riders paid their fair share. The problem I see is that the people who will be making the decisions could be the ones who do not use the TTC, GO, or PRESTO for that matter. Instead of doing what is the best for the TTC riders, they will instead look at the balance sheet and try to see what will have the best return on the investment. Which ones actually use the TTC on a regular basic, and not for a photo-op? I await the inevitable disaster that will be the introduction of Presto to those of us who use an MDP. Not only is there the threat of a significant increase to the most avid users of the pass, and the communications on all this are likely to be poor, but the ease of use that makes the MDP such a good source of TTC revenue is likely to be bargained away. The subscription service is the gold mine of product delivery. People commit to give you money each month and you ship it to them. Its efficient, it provides steady cash flow you can count on as a business and customers don’t have to worry or think. That is the genius of the MDP. Efficient steady cash flow. MDP users are the most efficient users of the delivery system of those passes. Right now, it is mailed it to us and we don’t bother the collectors or stand in the lines for the machines. No thinking required. And, in theory, MDP people with Presto should be even simpler – money comes off at the beginning of the month and we don’t have to worry about it. In practice, the MDP is now a bargaining chip between camps within the TTC who are struggling to meet the unrealistic operations budget cut by, of course, increasing revenue. So, MDP users are potentially going to have to self load and then watch how much we use the darn thing, which takes away the whole purpose behind using MDP which is make it so we don’t have to think about it. And, we are likely to lose the monetary advantage of being loyal customers who you can count on for revenue. Does the TTC not realise that every business out there WANTS loyal subscription customers who give a company money every month? Do they have no idea of what cashflow means? I get the idea of having a ride limit that you reach and..boom…don’t pay more for the month or for the day. That makes sense for the riders who make a pass decision each month. But, a lot of us who use MPD, we’ve made that decision. We are going to use the TTC and…here’s my banking information to make the payment simple. What MDP riders want is pay monthly and..boom…don’t make me have to count rides. Which, when you think about it, probably gives the TTC even more revenue then it would get. Steve: Er .. ah .. you are aware that Presto already includes an auto-renewal feature for monthly passes? The only question for the TTC implementation would be how they will handle MDP versus “standard” customers. I’m assuming the TTC will go for the monthly cap, for one it will eliminate the transferable pass. I’ll not handing over my card for someone else to rack up the fares unless I know for that month I will hit the cap. I do prefer to buy in bulk, my only bug-bear with the passes is that you have to buy for the 1st of the month or for a Monday. Is Presto able to buy bulk fares in blocks of consecutive days, e.g. 7, 14, 28 or 90 days. I came from a medium sized city in the UK and that’s how bulk fares were bought. When you tap on it will tell you how many days left and doesn’t matter when you start your days, you have the option of buying when you need either in person or on-line or you can set up a subscription that will debit your account or is that too complicated for Presto. One other question, with the elimination of the day pass, does that spell the end of the group/family pass? Steve: I don’t know if Presto has the ability to buy “x” days of travel. As for the family pass, I don’t think they have worked that out yet. Easily enough done for surface vehicles, but fare gates are a problem. I didn’t see the VIP (Volume Incentive Plan) Metropass listed above. The TTC VIP page has details of pricing, which can be as low as $124.50 for an adult pass. It’s unclear what will happen when everything gets migrated to Presto. I suspect the VIP plan will be quietly buried. Searching for “VIP” on the TTC’s site gives this tantalizing hit from the Presto FAQ, “card. I have VIP pricing, what happens when PRESTO is rolled out across the TTC? The VIP program will eventually be discontinued. VIP”. However, following the link, I didn’t find any mention of VIP in the General Questions section. I don’t think this has been thought through yet. Steve: It has already been decided that VIP is going away. The premise was that the bulk sales through institutions and businesses saved the TTC money which was passed on as a reduced price. With Presto, everyone will have their own card, Presto will collect (and charge a fee for) the revenue, and the economic justification (to the TTC) vanishes. Steve: This is one of the more bone-headed parts of the Presto info for the simple reason that there is NO provision for fare gates between surface transfer areas and the subway. It’s messy going the other way too. Someone may walk into a station and need to tap just to get into the paid area, but they are supposed to tap again when they board a surface vehicle in that station so that the transfer rules can be properly applied to the next leg of their trip. It gets even messier if the subway becomes a separate fare zone not to mention fare by distance schemes. I currently buy the pass for $124.50 and definitely don’t max out the rides per month. I do use it as a convenience sometimes locally, riding the streetcar for two or three stops rather than walking. When I’m forced to Presto, if nothing changes in my work location, I may only make twenty or thirty trips a month, definitely providing less revenue to the TTC than I do at present. Family tickets: I will not be surprised if these are eliminated – they seem far less necessary now kids under 12 can travel free. In London (UK) they only offer Group Fares for groups of 10 or more and they must use paper tickets; (“For groups of 10 or more fare-paying passengers you can get Group Day Travelcards. These provide unlimited travel after 09:30 and any time on weekends and public holidays within the zones paid for on Tube, DLR, London Overground, TfL Rail most National Rail services. They can also be used on all London bus services and on trams. You can only get these as paper tickets, not on an Oyster card. Group Day Travelcards are available from ticket machines at Tube stations or from London Overground or TfL Rail station ticket offices and some National Rail stations that Tube and London Overground services run through. In addition to the more familiar (to me anyway) reduced fares for children, students and seniors, London also offers lower fares for apprentices and the unemployed. Steve: Toronto is quite selective about which aspects of “London” they import to our system. Is there any explanation from the TTC as to how we will use a Metropass equivalent on the Presto card in future? I was once told we would just tap each fare until the monthly cost had been reached – then we could keep using it until the end of the month without further deductions. Or will we just have to pay for each use – which could be much more than the cost of a Metropass in a month? It’s so unclear to me …. Steve: It’s unclear to everyone. The TTC has talked about various models. Presto supports the equivalent of a monthly pass, as well as capped charges within a period, and so either model could be implemented. I believe part of the problem with fare policy is that the TTC is tied in knots worrying about the 2017 operating subsidy and what might happen to the fare structure. At least one member of the board wants to just get rid of the Metropass completely. The lay of the land will not be clearer until there is at least a preliminary version of the TTC budget presented publicly. If that does not happen at the Budget Committee meeting in early September, we should all wonder just why we bothering having a TTC Board in the first place. Interesting stuff. One thing I’m curious about is the pure weekday commuter who only takes the TTC back and forth to work. This segment is tough to parse out given the way the data is presented, but it looks to me like these folks would take around 9.36 trips per week over the study period (assuming 15 transit free vacation days and excluding the 13 statutory holidays that fell during the week). At $2.90 a ride, the 730 trips would cost these folks $2,117 if paid by token or $2,547 if a regular pass was purchased. Maybe $23.89 per month extra for the pass is a reasonable convenience fee for some, but it seems pretty steep to me. This segment is mostly buried in the 4 to 9 & 10 to 14 ride groups which collectively make up 31% of diary rides. It would be helpful to know how big the group really is, given that their relatively low price sensitivity permits the subsidy for higher volume users. I’d also expect that this group may be the most likely to switch away from using a pass if/when the relative “convenience” shrinks. Finally, I wonder why the TTC hasn’t tried to shift usage away from rush hour(s) by introducing exclusive weekday/day-time passes at a lower price point than existing full-time passes. Perhaps the enforcement logistics are too daunting, but it seems to me that a commuter pass could more effectively segment ridership between the two many user groups, simplify transfers with other transit systems (and parking lots), clarify the subsidy issue and perhaps lead to ore effective capacity management. Steve: If someone had been a regular pass user over the 18 month period, then they quite likely would be an MDP subscriber in which case the cost of 18 passes is $2,335.50. These would be entitled to a 15% tax credit not available to token users, bringing the net cost of the passes down to $1,985 which is cheaper than token fares. The chart of these values shows a clear sawtooth pattern where odd values are lower than adjacent even ones. This makes sense if the users are more commonly round trip commuters taking an even number of trips per week. As for off-peak passes, this has been suggested before and is most easily enforced via some form of electronic pass reader. The problem is the definition of “off peak”: does this apply to the beginning of the trip, or to all stages along the way. Someone who lives in Scarborough and takes an hour or more to finish their trip would have to start that trip earlier to finish within an off peak window than someone who lives “downtown” and makes a short trip. Similarly, someone going home after work or school would start off at the same time (the beginning of the evening period), but would get home later the further they lived from their daytime location. This is an equity issue because those who can afford to live close to where they work tend to be better off, and the benefit of the discount could fall disproportionately to them. I used to buy the Metropass out of convenience, since having to hunt around for tokens or coins was a major annoyance, but with the continual hike in prices, it was no longer worth the convenience. It never made financial sense for me, taking 40 trips a month on average. It was particularly bad for months I was away on vacation, so the monthly subscription discount never worked either. My workplace and residence have since changed, and now walking the 2.5 km along King St is almost as fast as the streetcar at rush hour. I would be surprised if a streetcar even averaged 10 km/h (including waiting for it to show up). I still take the streetcar to arrive less sweaty in the mornings, and because Presto makes it somewhat convenient. If I had to hunt tokens I’d probably walk. TTC service across downtown is marginal as is (slow, inconsistent schedules, hot, and my stop was recently removed). I know it’s not entirely the TTC’s fault (Bombardier delays, lack of signal priority, mixed traffic, lack of traffic enforcement), but overall experience is poor. If the TTC are not using 2 hour transfer window, and they will be retaining the current transfer structure, they must retain the whole current structure. If I need to tap in to the station paid area, then tap in to the bus I will have paid 2 fares. This is unacceptable. The current subway station transfer vending will need to be retained, and bus boarding will need to be kept as it is today where bus drivers do not issue transfers within a paid area. Steve: You make an invalid assumption here. A “tap in” only charges a fare if it is considered to be an invalid “transfer” point, but entering a station and then boarding a bus is a legitimate one-fare move. If the capped charge model is used to replace monthly pass, transfers must be used, otherwise a tap at each transfer will add a fare (up to the cap). If tap in on each vehicle is required, and the average trip transfers to 3 vehicles, this means I will be paying 6 fares per day (Assume 2 trips), hitting my cap in a little over a week. Steve: Again you equate taps with fares, and that’s not how Presto works even with the current implementation on TTC. If you move from one vehicle to another at a “legitimate” transfer point and within a reasonable time, you are not charged a second fare. Problems will arise with diversions and short turns, all of which could be avoided by a time-based fare (e.g. two hours riding before a “tap” costs another fare). Presto is already capable of doing this, but the TTC, for political reasons between the Board, Council and the Mayor, does not want to enable this. If I currently buy a monthly pass for convenience but use it for fewer than 40 trips per week, there will no longer be a convenience factor and a good chance I will be overpaying. (I will need to abide by the transfer rules i.e. no more stopovers). Steve: I think you mean 40 trips per month. If the TTC uses fare capping, then the problem arises if you only take say 35 trips but are charged for 40. Again this ties in with the transfer rules which as you point out don’t allow stopovers. But you would face the same problem paying with tokens anyhow, and that’s why you use a pass. Also of course the cap will be higher than 40 on the TTC because the break even point is now above this level. A 40 cap would be equivalent to reducing the price of the Metropass, and that is not going to happen in the current political environment. One other factor: When I started using Presto, there were 3 instances I had to deal with Presto. Each took about 15 minutes on the phone. How big will the TTC call center be to handle the problems that can be created with thousands of people when even the TTC is having trouble working it out. Steve: I agree that the TTC has not thought through the implications of a Presto fare structure where disputes will be common. “Pass” formats including timed fares would eliminate a lot of this (not all, but many possible “failures” in the fare collection simply would not exist if “transfers” disappeared). This will probably be the TTC’s single biggest headache given that they hate hiring new staff to do anything. You make an invalid assumption here. A “tap in” only charges a fare if it is considered to be an invalid “transfer” point, but entering a station and then boarding a bus is a legitimate one-fare move. Which is fine until you hit situations with ad hoc diversions and short turns in which legal transfers would be considered illegal by the system. In a post token world I hope the plan isn’t for the TTC to continue issuing paper transfers to bus loads of people. Really the only way to make it work all of the time is with a 2 hour window or to just not tap upon entry of the second vehicle. The latter would go over well with operators! Exactly, Steve, the way I see it as an MDP member I will see an increase in cost to me and probably lead me to use the system less. As with typical politicians I suspect that they will use this and coupled with an unreliable service (I’m beginning to think the unreliability is deliberate ploy to reduce demand especially on weekends) to hack the system to death. We all know politicians don’t look at the overall picture, one less rider could well mean on less parking spot available, CP24 will be in the lot at Yorkdale everyday interviewing frustrated drivers taking an hour to find a spot instead of just at Xmas. What do they want: a cheap transit service or gridlocked streets? Seems there is no winning!! I believe part of the problem with fare policy is that the TTC is tied in knots worrying about the 2017 operating subsidy and what might happen to the fare structure. At least one member of the board wants to just get rid of the Metropass completely. This is just a further example of the nonsensical approach to City budgeting. It might help to conform to a simplistic slogan that entails keeping property taxes increases at or below the inflation rate – but the burden on Citizens – who pay both taxes and TTC fares increases. The progressive vs. regressive impact of this form of indirect taxation is open to debate – a large number of pass holders are relatively well off – but a significant number would also be from a poorer demographic who would lose access to a fixed and capped cost for public transportation. I remain really puzzled at the TTC management’s apparent aversion to timed transfers. As noted by many, they would greatly reduce PRESTO programing and ongoing administrative costs, avoid unnecessary conflicts and probably cost FAR less in ‘lost fares’ than the $20 million figure that seems to have been produced out of thin air. One of the greatest benefits would be to avoid many operator-customer confrontations and I am surprised that Bob Kinnear and ATU Local 113 are not out there making the case for it. Thanks Steve. To clarify, I was trying to get a sense of the significance of the pure weekday commuter. 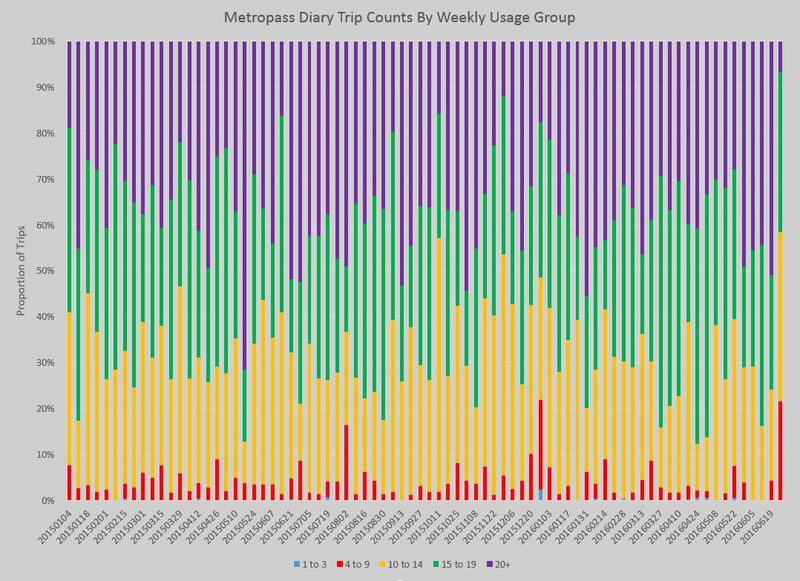 Using my previous transit day calculations and assuming pure commuters were a subset of the 8, 9 & 10 trip groups, this segment accounts for something less than 12% of all diaries and below 7% of total trips. These numbers don’t make sense to me, especially since according to TTC 2014 travel data (both pass holder and non-pass holder), total peak period travel (i.e. trips taken during the 7 hour regular weekday window) accounted for 43% of all TTC trips that year. 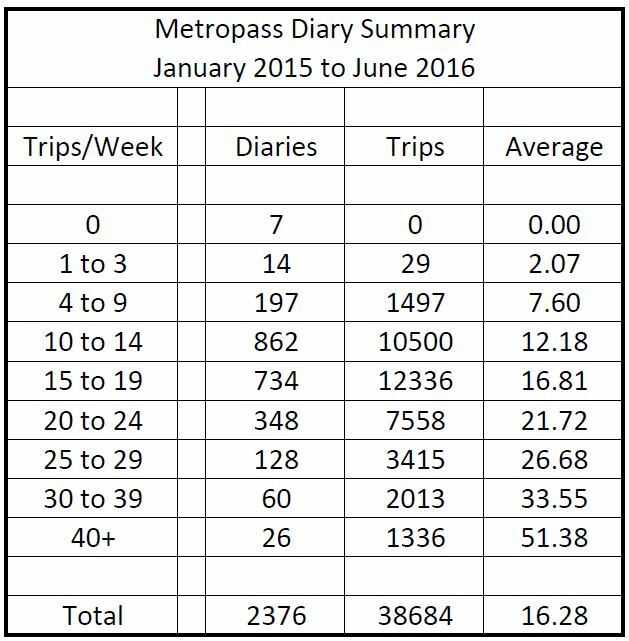 So either the diaries drastically undercount the pure commuter segment or very few pure commuters actually buy passes or very few pure commuters exist. Or perhaps I’ve missed something more fundamental. I also appreciate your insights on the off-peak pricing issue. I have to admit though that I have difficult comprehending why the powers that be would allow a heavily subjective “equity” issue to prevent them from using pricing to redistribute ridership to non-peak hours and provide a better service experience for (almost) everyone. Steve: The “equity” issue is one that I raise, not the PTB, because I hear endlessly here about how downtown-oriented decisions discriminate against suburban (read “poorer”) riders. To my mind, the big gap between the peak and non-peak average hourly ridership (131,801 vs 57,931) suggests immense potential from even a modest move to a peak/non-peak pricing matrix. Finally, I have recently become a semi-regular reader of your site. I enjoy it and I’m grateful for your thorough analysis and explanations. You offer a great site! Steve: Another point about off-peak pricing is that roughly 60% of all trips are taken “off peak”. Making them cheaper is a non-starter unless we raise the cost of peak trips. It won’t eliminate the transferable pass, but it might change how some people see it. Despite having a place for your signature on the back, Presto cards are transferable except in the cases of a card that is configured for a concession fare being used by someone not entitled to the concession. I’m sure Paul Sherwood is not alone in not wanting to hand over his card to someone else, but I suspect that for each person like him, there is at least one who finds their situation would make economic sense if they could share a pass with someone, but not having the full amount to pay at the start of the month, they won’t do it. If charge caps are used by the TTC with Presto, they can continue to pay separately by sharing one card and end up taking advantage of the fare cap to get the benefits of a shared monthly pass without having to fork over all of the dough at the start of the month. To each his/her own. I do prefer to buy in bulk, my only bug-bear with the passes is that you have to buy for the 1st of the month or for a Monday. Is Presto able to buy bulk fares in blocks of consecutive days, e.g. 7, 14, 28 or 90 days. Unless the TTC implements some kind of day pass for an individual on Presto, probably not. However, you can purchase in whatever amount you will need in that format. Up until earlier this year, I needed to use YRT to get to work in the morning, but I got a ride home at the end of my day. This meant that each week I would need five fares for the week, which were $3.40 at the time. Each Friday evening, I would do an online load of $17, effectively loading five days’ worth of fares to my card. The minimum load amount is $10. All the talk about how the TTC’s archaic transfer rules being applied to Presto will cause nightmares when diversions and short turns occur, not to mention out-of-service readers in the middle of a trip. During the first six months of this operation, the TTC will find things are so messed up with complaints and customers running out of balance on their cards during a trip due to charges that should not have been charges, that they will announce they will switch to a 2-hour system for a six month trial. At the end of the six months, they will conduct a survey asking riders whether they prefer the A-to-Z transfer policy or the 2-hour transfer policy. The survey will find that 20% prefer the A-to-Z policy and 20% will prefer the 2-hour policy, but 60% will not care one way or the other. Since they have switched to the trial of 2-hour transfers, they will just keep it that way. Steve: You forgot the part where John Tory, who opposes timed fares because they will “cost money”, holds a photo op to tell us all how it’s part of his grand transit improvement strategy. If charge caps are used by the TTC with Presto, they can continue to pay separately by sharing one card and end up taking advantage of the fare cap to get the benefits of a shared monthly pass without having to fork over all of the dough at the start of the month. As one example of the levelled implementation, MiWay has a $130 monthly pass, which you can buy for 14 days prior or after the first of every month (For example, the April monthly pass is available to purchase from March 18th through till April 14th, and will be active from April 1st to April 30th.) This leaves a 2-3 day window every month where you cannot buy any monthly passes. In addition, weekly fares (Monday to Sunday) are capped at 12. So that’s equivalent to a weekly pass for $36. So that’s a $6 premium per week on not buying a monthly pass. Hamilton HSR allows you to pay for multiple passengers with the same Presto Card (you need to tell the driver) as well as they have a “Family” Day Pass for $13.60, which allows up to 6 people including up to 2 adults, but it’s separate to Presto. They do a weekly cap at 11, and a monthly pre-purchased pass, too. Oakville has a Presto “Student Freedom Pass” that’s free student rides after 4pm and all of July/August and Seniors are free on Mondays. Ottawa does a DayPass for $8.50, a month pass for $105.75, Presto single fare for $3.00, paper tickets for $3.30, and cash fare for $3.65. The DayPass is a Family DayPass on weekends and holidays with the same 6 people with up to 2 over 13. So really, the TTC is only limited by their own imaginations (and their fare gates). A two-hour transfer would go great lengths towards regional integration, like the rest of the 905 has. Once people get used to a “special fare”, it becomes very difficult to eliminate, like senior’s discounts, family passes, etc. Maybe a massive change in the fare system will allow some simplification. One factor that is overlooked is the cost of fare collection, both in money and in time. There are over 1.5 million fares collected each day, one way or another. Metropasses are simple – one transaction per month at a machine. You could have fun calculating the cost of selling tokens at a ticket booth. Include the collector’s salaries, the cash handling costs, the accounting controls, etc., and the cost per transaction is fairly high. Also the waiting time in lines is a factor for commuters. If Presto works well, and there are enough machines, then maybe we can move from Metropasses to Presto cards. Just be careful to consider the time factors in the “tap on, tap off” model, both on surface busses at transfer points, and at Bloor-Yonge station when changing lines. If we need to have proper proof of payment at all times, there may be some significant costs in money and in time. Most transit users want consistency in the fares paid. Make sure Presto charges meet that need. A trip I took last week. Mccowan & Steeles to Lambton & Weston. Took Steeles East to Yonge, Steeles West to York Univ. Keele to Weston & Rogers. Weston North to Lambton. Would Presto see this as 1 trip or not. Or is there a better way to get there. Stan raises an interesting question. Also, the TTC’s old trip planner has recently been replaced by a “beta” called Triplinx, which may have something to do with Metrolinx and says that it covers trip planning for the GTHA. This makes me wonder if only routings given by the transit planner would be considered legit. In this case, Triplinx says to go to STC, take RT and BD to Keele station, 89 Weston to destination. That is a reasonable suggestion, and it claims that you can leave 4:04 PM and arrive at 5:52 PM (on a weekday). The question then is, what if you take an alternate route? Say the RT is down. There are multiple crosstown options (I would be trying the Finch East Rocket branch to York U and then south on Jane Rocket, but there are so many other ways to do this). Will Presto implement Triplinx logic (or vice-versa) and say that you’re not travelling on the official route, so it’s not a single trip? I have also seen trip planners give odd results. I checked, and Triplinx does do much better on a certain trip that the TTC’s old planner always produced ridiculous results on, so there may be some grounds for optimism. When Presto was first introduced to the 905 transit agencies, Brampton implemented both the weekly and monthly passes through capping. Once you reached the cost of the weekly pass in a week, nothing further was deducted from your balance for the rest of the week, and it would start again the next week, until one reached the price of the monthly pass and then it would cap for the rest of the month. Sadly, Brampton has changed to period passes for both weekly and monthly. It seems that more and more of the GTHA transit agencies have shifted to going with prepaid period passes (i.e. : the same purchase model that paper technology demanded). It strikes me that having a capping purchase model (or a choice between the two) that card technology enables is a way to capture some additional ridership that might not otherwise be captured (e.g. : people who use transit in a limited way might start using it more if they are just a few rides away from getting the rest of the month for free). At least the period passes implement a 2-hour transfer when one first boards, so if the journey continues on another agency (except GO and the TTC), one does not have to pay the other agency’s fare if tapping on within the start of the 2-hour window. (MiWay and Brampton are clear about this on their websites, but YRT isn’t). A trip I took last week. Mccowan & Steeles to Lambton & Weston. Took Steeles East to Yonge, Steeles West to York Univ. Keele to Weston & Rogers. Weston North to Lambton. Would Presto see this as 1 trip or not. If everything is working, yes. The question is: how big is that IF? Now that would cost an extra fare under a 2-hour transfer policy. Perhaps there is a better route to take, but this is where zone fares with time-extension within Toronto might make sense. Instead of having to pay a full additional fare, one could pay a zone-upgrade of perhaps a buck or two. Note that I said, “with time-extension”. This is not something that is implemented on YRT, where there are three zones. One pays an extra $1 per extra zone, but there is still only two hours from the first tap on. It is not necessary to pay the $1 at the time of the first tap-on, but one must do so before the end of the 2 hours and before tapping on once in a new zone. Logically, if one were taking a longer trip that requires a second zone, one should be allowed a little more time, say an additional 30 or 60 minutes. As far as I’m aware, the subway system is treated as a single continuous fare zone. The delays with ‘tap off’ could be eliminated with a 2-hour transfer. Will Presto implement Triplinx logic (or vice-versa) and say that you’re not travelling on the official route, so it’s not a single trip? Presto has to “know” if a link is a transfer or new trip before you start that leg, so an “official route” to some unknown destination wouldn’t apply. I agree that it seems like the Transit Agencies are really hampering the flexibility of Presto to squeak out a bit more money. Even the capping model is pretty dumb being set Monday to Sunday. Now that would cost an extra fare under a 2-hour transfer policy. Perhaps there is a better route to take, but this is where zone fares with time-extension within Toronto might make sense. It’s interesting how fare policy will affect route planning. In the case of a 2-hour transfer (allowing you to remain on your last leg after tapping on), that would mean an east-west as your final leg and possibly walking a bit extra. Steve: I would add that any fare structure (other than a completely flat fare) will have cases where some people will be caught for an extra fare. This will happen with zones (even with a courtesy zone overlap) and with time based fares. Someone will always be “over the line”. The challenge is to design a fare structure that provides the greatest benefit for the greatest number and does not unduly penalize some in the interests of the many. “Unduly” does not mean “never”. Note that I said, “with time-extension”. Steve: Also, I believe that the TTC overestimated that $20m number by 100% essentially by counting both the “to” and “from” fares of time based trips as losses rather than just the “from” fare. However, until the issue gets back on the table and we can force the TTC to defend their calculation, the larger number stands and is a major impediment. Allow me to use an example I encountered earlier. When I was looking to get to Skymark Hub out in west end the TTC trip planner told me to go to Islington and take the 109 to Skymark Ave. What the TTC trip planner failed to mention was that the 112B West Mall also goes to to Skymark Ave and that Skymark Ave is currently closed for road construction. It only gave me bus options for Miway and not the TTC despite the 32 and 112 going within walking distance. It also showed the buses running down a closed road instead of it being on diversion. If I followed the instructions on the trip planner I would end up paying an extra fare needlessly. “The problem I see is that the people who will be making the decisions could be the ones who do not use the TTC, GO, or PRESTO for that matter. Instead of doing what is the best for the TTC riders, they will instead look at the balance sheet and try to see what will have the best return on the investment. The second councillor on this list is well-known for his partisan leanings towards the Scarborough Subway Extension and his “Wall of Hatred”(TM) for Scarberians built and maintained by those “downtown elites” – another lovely catchphrase, given the cost of many suburban homes these days. Perhaps he should join Mayor Tory and Bianca Spence, who challenged the Chief Magistrate to ride the entire Bloor Subway line from Kipling to Kennedy Stations in an un-air-conditioned subway car to experience what some riders do on their daily commute along the subway-subway-subway system. This way, Mr. DeB can let his constituents see – via his sweat-stained underarms – what their wonderful subway connection may have in store for them if the current cars haven’t been replaced by then – or at least repaired sufficiently prior to the summer heatwaves…. Remember, when you’re a salesman, you acc-cen-tu-ate the positive and eliminate the negative so your sucker – er, I mean *customer* is eager to buy what you’re proffering. Meanwhile, Councillors Crisanti and Minnan-Wong are two of the five in the cabal who demanded an emergency TTC Board meeting for February 21, 2012 and then voted – in the majority – to sack TTC General Manager Gary Webster. How much actual interest do they have in maintaining a functioning system that benefits riders (who happen to be taxpayers too!) ? Hmmm… overcrowding…. Well we should have addressed that by now, no? No one on City Council bats an eyelash about dropping half-a-billion dollars to repair the Gardiner Expressway before spending much more on redesigning and revising it in its new-and-improved form. Meanwhile, they can’t seem to figure out that transit is a huge deal for millions of people in the GTHA and messing around with partisan politics to score points with constituents rather than agreeing that the TTC is an important social good and that expanding the system and its components in a gradual, practical and *thoughtful* manner is the way to go. Figuring out what you want Presto to do in advance of asking for its design avoids stupid hiccups and teething pains to riders who just want to get where they’re going. Mapleson mentioned that Ottawa has a Daypass and how the TTC is limited by its own lack of imagination. True. However in fairness to the TTC, OC Transpo is also limited by its imagination. Metrolinx confirmed that we can pay a Daypass on our Presto card (and I have done so many times) and also have that card coded with the pass in the same way you have a transfer on it (which OC Transpo doesn’t allow). However OC Transpo says it would be difficult for drivers to check if the Daypass is valid hence we get a piece of paper. Presumably as we are moving to fare gates in 2018 with the new LRT this will change, but interesting to note that sometimes too many executives invent out of this world scenarios which never happen. How difficult is it for a driver to see on the screen (at least in Ottawa we have a rather large screen for the driver, don’t remember how the TTC does it) to see what fare or pass you just tapped in. The TL;DR version is there’s no problem with Presto and having a Daypass unless you make it a problem. Steve: There is no screen for the driver in Toronto. With regards to the MDP I think you will lose it. We had in Ottawa the Ecopass which was paid directly from our paycheques to OC Transpo. It was very efficient, no issues and even when people went on vacation they didn’t mind continuing paying as the discount made it interesting. When Presto arrived they decided to cancel this system saying that with auto-reload it’s convenient. There are still issues of ID theft with the contractor and of course banks can always and do mess it up. I have noticed that even though more and more people in Ottawa do use Presto (or so is claim by the city) the lines at OC customer service centres continue to grow. But the discount disappeared… it was enough to encourage couples who work downtown to instead get a monthly parking and drive to work. It’s been a disaster and with the 25th anniversary of the Transitway (BRT) OC Transpo had just got back to the ridership it had at the opening, which it lost again. It should be a scandal. Perhaps with the congestion in Toronto you won’t have that issue, but then again at some point am sure people will make that calculation that with the subway being jammed as it is, and the bus and streetcars being stuck in traffic, might as well enjoy the ride in my own car… you know the argument. We should not have to have those discussions in this day and age. And all the handwringing about fares and fare rules and not just in Toronto, makes me despair of politicians who obviously continue to regard transit as a necessary evil to provide but an evil nonetheless. No one on City Council bats an eyelash about dropping half-a-billion dollars to repair the Gardiner Expressway before spending much more on redesigning and revising it in its new-and-improved form. It’s not quite that bad. The vote to approve the current Gardiner plan barely passed in Council, with 24 in favour and 21 opposed; an earlier vote to tear down the little-used eastern segment was far from unanimous, failing 19-26. There are more than a few current councillors who aren’t wedded to the automobile (or to whatever gives them the most power, as I suspect is a bigger motivator). Not a majority at the moment, though.